This article is a workup of replacement of my 2mm HDC G5RV and feedline with high strength 1.6 aluminium MIG wire to evaluate practical issues with use of an aluminium conductor. The G5RV configuration is an inverted V, and although half a G5RV is 15m, the supports result in a 20m length of wire to the support. 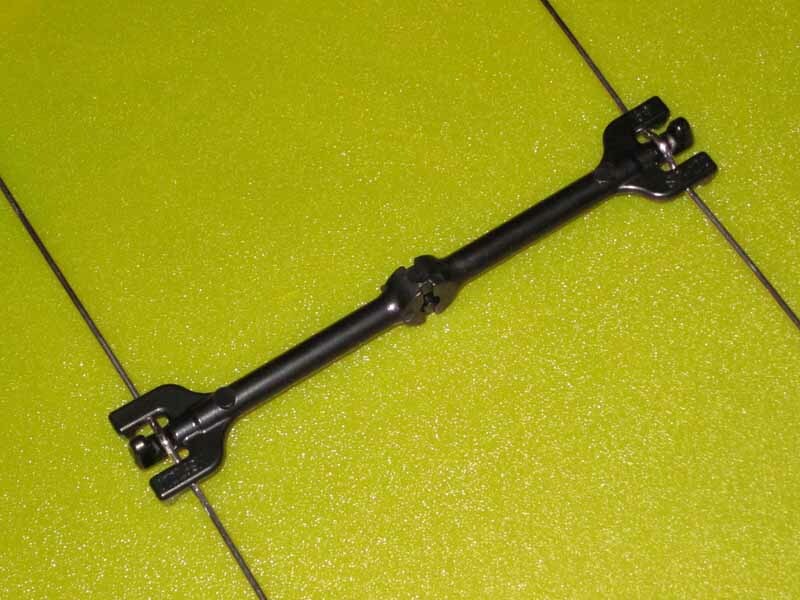 The configuration has a central support and simple spans for each leg of the G5RV to their respective supports. Density of aluminium is 2700kg/m^3, so the mass per unit length of 1.6mm wire is 0.00543kg/m. 5356 wire is specified as 39ksi which is 270MPa. 1.6mm 5356 wire then has a gross breaking strain of 543N. Based on conductivity of 36e6S/m and skin effect, RF resistance at 3.5MHz is 0.126Ω/m, 27% higher than that of equivalent size plain copper. The existing 9.5m open wire line (2mm copper spaced 50mm) has been calculated to have a loss under mismatch at 3.6MHz (load Z 35-j350Ω) of 0.26dB, the 1.6mm aluminium spaced 52mm would have a loss of 0.39dB, well less than the loss of commercial CCS windowed ladder line. Using Antenna wire catenary calculator, the catenary is calculated for the desired span with the wire parameters. The heights used in the calculator above are relative to the lower end of the span. Above is a mockup of a dipole leg terminated on an insulator, and the feed line connected using the 3mm stainless steel tap connector. In use, the tap connector will be filled with marine grease or aluminium jointing compound to exclude oxygen and water. 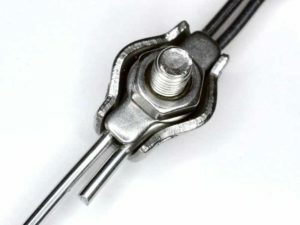 Above is the 2mm stainless connector which will probably be used. 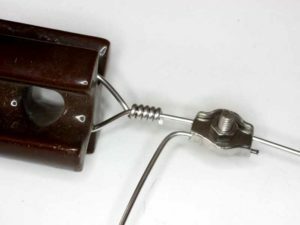 The 1.6mm wire has to be bent to follow the path through this smaller connector body. 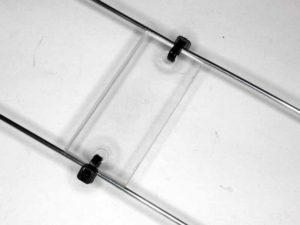 Above, the feed line will be the pair or 1.6mm aluminium wires spaced 50mm, here using small pieces of 2mm clear acrylic and zip ties. Performance is calculated at 3.6MHz with a load similar to that of the existing G5RV inverted V dipole. Loss under standing waves is about 0.4dB, less than 0.15dB higher than the existing 2mm copper feed line. Above is the Sotabeams 110mm spacer threaded with the 1.6mm aluminium wire.